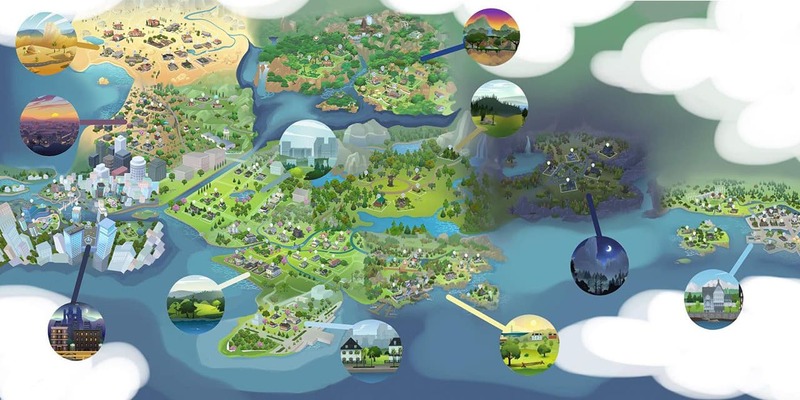 Have you ever wondered what would The Sims 4’s worlds that we’ve gotten so far would look like connected altogether? Well, a Simmer on Instagram @stellar_roses has posted an interesting concept of every single world including the ones from Base Game, Expansion Packs and Game Packs connected! You can notice that worlds such as Oasis Springs, Del Sol Valley and San Myshuno have perfectly been connected together as well as Willow Creek, Newcrest, Granite Falls and Brindleton Bay. There are worlds like Selvadorada and Forgotten Hollow which don’t really fit in together but that’s primarily because they’re so specific due to their Destination / Occult theme. I think this is super cool and very interesting! I want to download this image and set it as my wallpaper! How can i do that? No need for help right now! I figured it out myself! Forgotten Hollow isn’t a destination though? It’s an inhabitable world. The reason it doesn’t “fit in” is because it’s a dark hollow, while everything else is sunny and bright. Also, I’d probably have the lot sizes match up better. The game pack worlds are really tiny (besides Selvadorada? ); they really shouldn’t be the same size as the much bigger worlds. Besides that, this is a neat idea! It would definitely explain how the same sims show up all over the place. I was just thinking about this last weekend and could not find anything, so I made one myself. It is funny how it is almost similar! I LOVE IT. It makes the entire world feel more alive and connected. I really hope the devs to this because ahhhh this makes me so happy.